Swagbucks is still a great little earner, I don't use it as much as I should, purely due to other commitments but I average 50 points a day just from videos, so that means in a month I get at least £10. I normally get Paypal or Mastercards but you can get so many rewards including Amazon and other vouchers starting at £3, plus members accepted worldwide. So if you haven't already joined, you should really, I'm earning over £120 a year from Swagbucks with little or no effort. I think Superpay.me explain very well how to earn from their site, so rather than me try and explain it, I'll ust tell you what they say. The best thing about this site, is they have instant paypal payouts, so you don't have to wait. 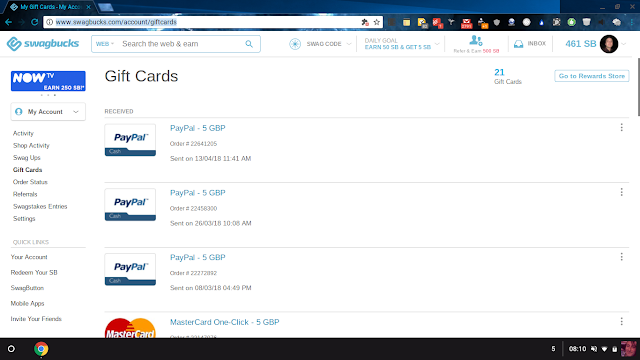 Of course if you don't want to use paypal there are numerous other options. SuperPay.me only earns revenue when YOU (our member) earn money by completing our offers. The most important tip we can give you is this - CLEAR YOUR BROWSER COOKIES This is a simple task but is very important and will ensure that you get credited 100% for every offer you complete. Many of our members recommend using a programme such as ccleaner to help with this. When you finish the Survey or Offer, leave the success page open for a few minutes or until the Survey/Offer credits. To start earning money please click on the "MAKE MONEY" or the "OFFER WALLS" menu items on the top menu navigation tabs. Here you will see all the different types of free offers ( including Watching videos, CPC, Quick Submits, Trial offers etc ) we have available for members from your location. Our offers are updated DAILY. If there are no offers for you today, there could be offers available for your tomorrow. So keep coming back and checking daily. Some offers are credited in cash. Some offers are credited in points. The advertiser decides. You can withdraw your money once your account reaches our minimum payout limit of $1.00 Cash offers are paid via Instant Paypal, Payza, Bitcoin or Skirll. It's your choice. Points offers are paid via Amazon Gift Cards. Mintvine is probably one of my favourite survey sites, always lots of surveys, including daily surveys, plus daily polls that earn you a few points as well. One thing I always forget to mention about Mintvine is its prize draws, for every survey you complete you get one entry into the daily, weekly and monthly draws, yes that's right, three different draws. So make sure you complete one survey a day and you get entered into each daily draw, 7 entries into each weekly draw and 30 into each monthly. Of course the more surveys you complete the more draws you get entered in. Mintvine unlike most other survey sites, also has an offers section, this basically allows you to complete offers, you then get your points added to your Mintvine account, which means you can cash out quicker. Offers include viewing videos, phone apps and lots more. I personally don't do the offers because I don't have the time, but its worth looking at. If you haven't signed up to Mintvine yet, the sooner you do, the sooner you will start earning. Join Mintvine today. I'm often asked well how do you earn this money from sites like this. Well its simple its about being logical about earning. Not just doing anything and everything. Earning from Swagbucks is actually very easy, you can easily earn £20 a month for not much time at all. How I hear you all say. Everyday when you log into swagbucks there will be a bar that says daily goal. So each day you log in, you see daily goal, it tells you have many swagbucks you need to earn that day in order to get the bonus, it can vary, it could be 50 or 200 average around 80-120 though. Now getting your daily goal is really easy. If you do 1 or 2 surveys a day that is 50-200 swagbucks for them surveys. Let the swagbucks app run videos and that is 10 a day, do a couple of overs that is around 20 - 40 a day depending on which offers and how much you do. Some offers give you thousands of swagbucks. The more you do the more you earn, but as you can see its really simple to earn a decent amount monthly for hardly any effort. This is one of the most well established and well publicised survey sites, with survey results often being used in local, national and international press. The length of each online survey varies, but most are between 5-7 minutes long. Surveys are rarely longer than 20 minutes, as this is considered a maximum. Most surveys will award between 50-100 points; the longer the survey, generally, the more points that are awarded. The automatic payout is 5000 points which is £50 which actually isn't that hard to achieve most get a payout every 2-3 months, some monthly. With GFK’s DIGITAL TRENDS PROGRAMME we measure internet usage i.e. which web pages you visit, which ads you look at and how log you stay on a page. This information is then used by us in an anonymous and aggregated way. The information collected from GFK’s DIGITAL TRENDS PROGRAMME helps other companies improve their online services provided to you. Web sites become more user-friendly and offer you the information you need. All you have to do is install a software and the measurement is done automatically. So, you can normally continue browsing the internet as usual! On-top of this, you will receive a £5 loyalty incentive every three months if you're active for at least one day each consecutive month. This adds up to at least £25 a year, more if you install it on your phones, and computers. To earn even more, sign up through swagbucks and you earn 250-350 swagbucks which is around £2 so so even more reason to sign up. You don't even notice the apps running. This is one of them sites that offers so many different ways to earn, whether its from surveys, from watching videos, downloading apps, playing games on facebook, the earning possibilities are endless. You have a choice of lots of payout options including cash, gift cards, donations etc. The Offerwalls are the main resource to earn Points as there are campaigns of all kinds. Choose one of the walls, looking for a campaign that you like, complete it with the outlined steps and earn the Points. Surveys are the most completed campaigns everyday. In our section 'Daily Surveys' you can fill out all the surveys available every day. In addition, we have special Weekly Surveys that are sent by email. Tasks are small and simple actions through which you can earn Points gradually. As you successfully complete the tasks, new ones will appear. If you get the hang of them, you will be able to earn many Points. With the Radio is very simple to earn Points. Enter into the section, select your favorite radio station and listen to music. Every 10 or 30 minutes, you have to fill out a captcha code to get the Points. The Videos are the easiest way to earn some Points. They are ads like the ones you see on television. Select one of the walls of videos, checks if there are some available and watch them all. The advantage is, that you work at your own pace, do as many tasks as you wish. The earning possibilities are only limited to the time you commit. Mobile software will earn you around £50 a year, Computer software around £100 a year, Surveys around £800 a year, other tasks around £200 a year. These amounts are based on around 5 hours a week of you having to do something. Of course add cash back sites, freebies and selling and this amount could be well in excess of the figures quoted.